Halloween Ideas for Kids - Recipes, Crafts, Activities, Costumes, and More! Nothing is more fun than a good-natured Halloween scare! 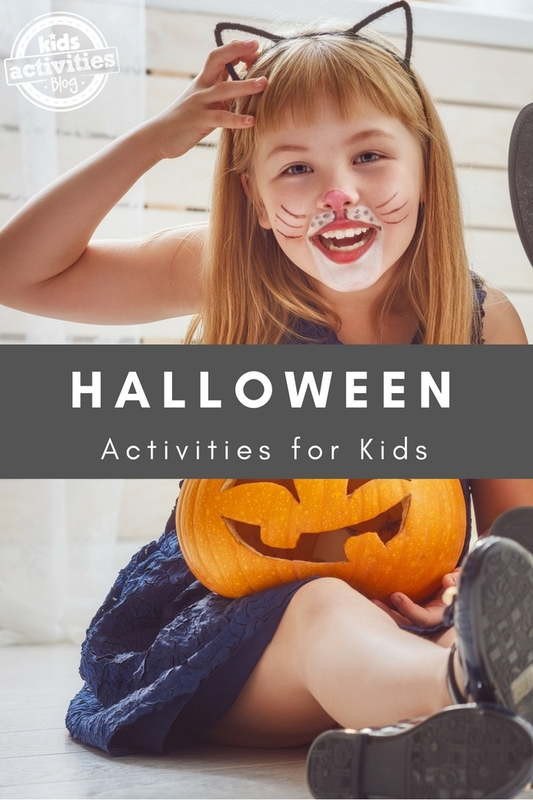 And Kids Activities Blog is full of Halloween ideas for kids. We’ve got Halloween Crafts, Recipes, Printables, Games, Costumes and more! Do your kids love ghosts and ghouls, fake blood and vampire teeth? Or do they favor cute costumes, dressing up as their favorite characters, and carving pumpkin faces? Whatever you love about Halloween, we’ve got more fun than you can dream up on your own. Halloween crafts for kids, lots of worksheets and printables, creepy recipes, spooky party games — even Halloween costumes for kids of all ages. Toilet Roll Black Cats – Make a black cat with this recycled craft tutorial! Dollar Store Halloween Craft Hacks – Save time and money with 15 fun Halloween crafts! Soda Bottle Bats – A little paint, a couple wiggly eyes, and some creativity transform this soda bottle into an adorable bat! Halloween Coffee Filter Craft – This preschool craft is sure to make little ones smile! Recycled Bottle Cap Spiders – There’s nothing to fear from these creepy crawly recycled spiders! 20 Halloween Crafts for Kids – We’re in love with all of these adorable Halloween crafts! Halloween Front Doors – Decorate the door with these fun Halloween designs! Halloween Luminaries – Looking for a way to light up the night? These Halloween luminaries are perfect! Footprint Ghosts – Use your feet to create the spookiest ghosts around! Spooky Eyeball Bracelets – These adorable cuff bracelets are made from cardboard tubes and a whole lot of giggles! Mini-Haunted Houses – Have a spooktacular time making these tiny haunted houses! Sewn Jack-o-Lantern Bag – This adorable sewing craft for kids is the perfect size for catching all of those Halloween night treats! Halloween Spider Craft – This easy paper plate craft is perfect for toddlers and preschoolers! Glow in the Dark Halloween Cards – Use cookie cutters to make some awesomely spooky glow-in-the-dark Halloween cards! Halloween Night Light – Say goodbye to the dark with this easy-for-kids-to-make Halloween Night Light craft! Halloween Coloring Pages for Kids – Get your coloring groove on with these kid-friendly, Halloween coloring pages! Halloween Ooey Gooey Sensory Activities – Prepare to get messy with some hands-on sensory activities! Halloween Math Worksheets – Get some math practice in with the help of some Halloween friends! No-Candy Halloween Printable – Giving out treats that aren’t candy? This printable “witches” your trick or treaters Happy Halloween anyway! Halloween Science Experiments – Create flaming ghosts with marshmallows and more with these fun science experiments and games! Brains and Eyes Halloween Sensory Bin – Dig around in a DIY version of brains and eyes with this fun activity. Ultimate Halloween Games for Kids – Here are some of the best and spookiest Halloween games around for your next Halloween party! Halloween Paint Chip Puzzles – Turn boring old paint chips into the perfect Halloween puzzles! TP Mummy Game – Break out the toilet paper, because you’ll be wrapped up in this game for awhile! Halloween Math Games – These Halloween-inspired math games make fact practice fun! Halloween Sight Word Game – Make funny sentences and learn to recognize Halloween words with this fun sight word game for kids! DIY Ghost Bowling – This kid-tested, parent-approved indoor bowling game will be a howling good time! Printable Halloween Games for Kids – These fun printable games are perfect for home or school! Candy Corn Sugar Cookies – Bake up a batch of these adorable (and tasty!) Candy Corn-inspired sugar cookies! Sweet Treats for Halloween – These five fun Halloween treats are super family-friendly! 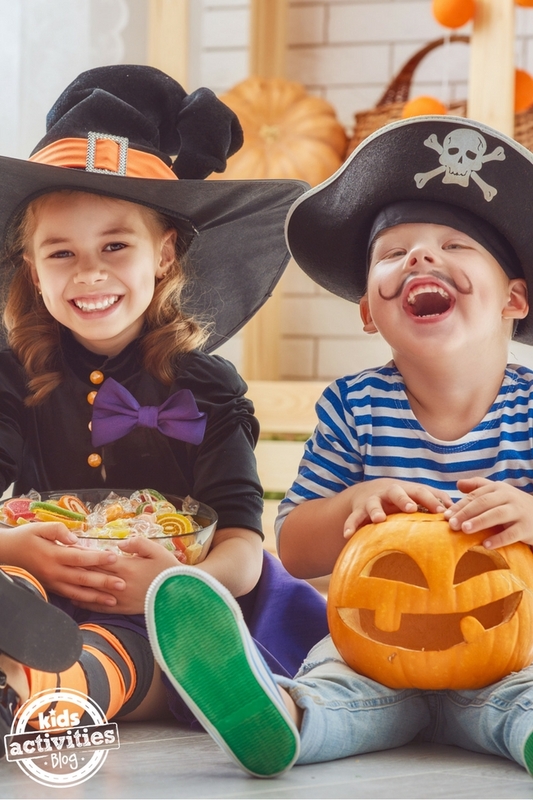 Halloween Treats for the Family – From Halloween popcorn to Mummy pizzas, these finger foods make the perfect Halloween treats. Fog Drinks – These spooky beverages will turn your next Halloween party from drab to fab in no time! Halloween Breakfast Ideas – Do-nut be afraid of these spooky breakfast treats on Halloween morning! We love these Halloween ideas for kids! Harry Potter’s Pumpkin Juice Recipe – This healthy juice tastes like Fall in a glass! Homemade Halloween Bark – You know your bark candy Halloween recipe is special when it has eyes! Halloween Banana Pops – Frozen banana pops are always fun, but these have a Halloween twist! Spooky Halloween Pudding Cups – These yummy Halloween treats are perfect for your Halloween party! Halloween Cookies – It’s a toss up which Halloween cookie recipe we like best, but the melted witches are a top contender. No-Bake Bats and Mummies – These frightfully good snacks are perfect for a Girl Scout or Boy Scout Halloween party activity! Scream Cheese Brownies and Oreo Cookie Pops – Check out these Halloween desserts that your kids are sure to love! Top Kids’ Halloween Costumes – Will your little one be a princess or warrior? There are fun costume options for everyone! Princess Halloween Costumes – Let your trick or treater dress up like the princess you know she is! Homemade Halloween Costumes – These adorable DIY Halloween costumes are easy enough to whip up in a weekend! DIY Checkers Halloween Costume for Kids – It’s amazing what a little cardboard, a few markers, and some glue and scissors can create with these Halloween ideas for kids! Face-in-Face Halloween Makeup – This Halloween makeup tutorial makes any costume come to life! 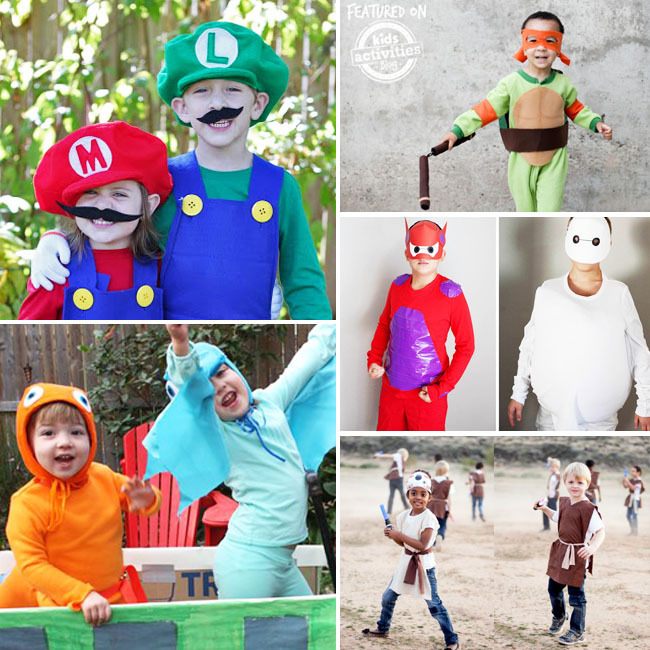 31 Totally Awesome Halloween Costumes for Boys – From a Knight in Shining Armour to a Lumberjack, these boys’ costumes are fun and easy to make! 18 Hero Costumes for Boys – Your little one’s inner hero will shine through with these hero Halloween costumes! DIY Halloween Costumes for Boys – “Le-Go” of your preconceived notions about how long homemade Halloween costumes should take, because these Halloween ideas for kids are perfect for last-minute costumes! iPad Halloween Costume for Boys and Girls – This free, DIY Halloween costume is perfect for your technology loving kids! Halloween Mask Printables – Create your own DIY Halloween costume with one of these printable Halloween Masks for kids! DIY Costumes for Babies – These infant Halloween costumes are too cute for words! Homemade Halloween Costumes for Kids – Forget expensive costumes, because these DIY designs are even cuter! Halloween Costumes for the Whole Family – Make it a family affair with these Halloween ideas for kids and adults with super costume ideas! Top 10 Halloween Costumes for Kids – These costumes make Halloween dress-up fun for everyone!